If you enjoy the tangy-sweet taste that comes from adding mandarin oranges, raisins, or chunks of apples to a salad, then you already know how delicious fruit in salad can be. 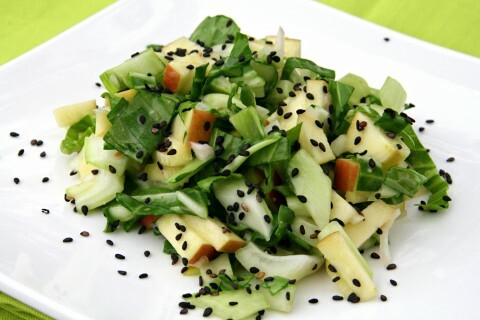 In this salad, bokchoy provides a succulent base. Toast the almonds in a heavy (preferably cast iron) skillet over high heat until they begin to brown slightly. Transfer the nuts to a bowl to cool. Toss the bok choy, apple, onion, and grapes in a large bowl. Pour the dressing over the ingredients; toss until everything is thoroughly combined. Season with salt and pepper to taste. Cover the bowl and set it aside at room temperature for 15 minutes to let the flavors develop. When you’re ready to serve, stir in the nuts. Eat just like this or use as a topping for your lettuce. Place squash cut side down in baking dish, add water to cover the bottom of the dish. Bake in the oven until flesh is easily pricked with a fork, about 45 minutes. When done, remove from oven and let cool until squash can be handled. Scoop out flesh and set aside. Bring to boil and then reduce heat to simmer, covered, 30 minutes: carrot juice, almond milk, apple cider vinegar, almonds, onion, carrot, garlic, apples, kale, and spices. 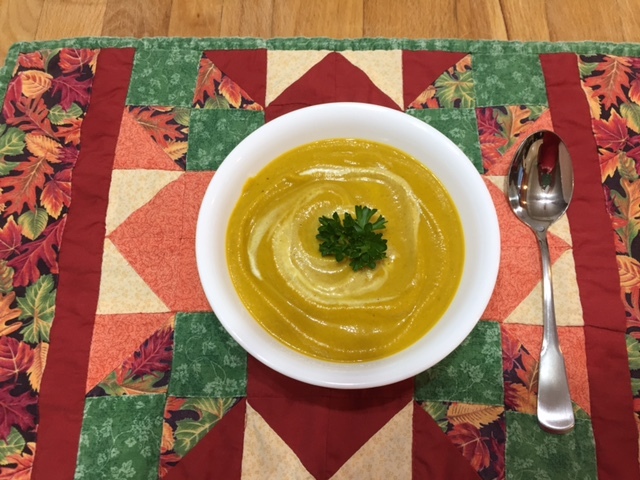 Ladle squash, vegetables, and liquid into Vita Mix or another high speed blender (necessary to “hide” kale and a great way to sneak it into your diet). Slowly increase speak to 10 then high for one minute. Pour pureed soup into a clean pot and repeat #5 until remaining ingredients are pureed. Mix all batches and serve hot.